Alex Harris is a photographer, a professor at Duke University, and an editor of DoubleTake Magazine. He lives in Durham, North Carolina. Simple ideas and unbelievable dreams. First steps and great miracles. Ordinary teenagers and a God who still uses young people to accomplish His big plans. That’s what our first book, Do Hard Things, is all about. Do Hard Things shows how young people can take hold of a more exciting option for their teen years than what society suggests. We wrote the book to counter the Myth of Adolescence, which says the teen years are a time to goof off and have fun before “real life” starts. We invited our peers to choose to do hard things for the glory of God and, in the process, turn the world’s idea of what teens are capable of upside down. Whether or not you’ve read Do Hard Things (we’d recommend it—but, of course, we’re a little biased), this companion book continues the Do Hard Things message and piles on stories, practical suggestions, and detailed how-tos. You can use it either on your own or in a group setting, depending on your situation. In other words, Do Hard Things marked the beginning of a movement. Start Here is your personal field guide to jumping in and getting involved. Since Do Hard Things came out, the Rebelution movement has exploded. In the past year, rebelutionary teens have raised tens of thousands of dollars to bring the gospel to and dig wells in Africa, won prestigious film festivals, fought human trafficking in the United States and around the world, and made it on the cover of ESPN The Magazine. Around the world, young people are moving out of their comfort zones—whether that means standing for Christ in a hostile classroom, raising money to build a dormitory for orphans in China, or mending relationships with parents or younger siblings. 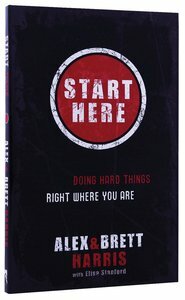 In short, this is a handbook full of practical steps and real-life stories to encourage and equip you on your journey of doing hard things. We want you to feel as if you’re at one of our conferences, or in a small group of people talking about doing hard things—which you may be! All the questions in the pages that follow come from people just like you, collected on our website and through personal conversations. We’ll do our best to answer them with stories and insights from our own lives. We’re traveling alongside you in this adventure—and we want to share with you what God has been teaching us these past few years. But just like Do Hard Things, this book isn’t about us. It’s about the incredible, seemingly impossible things God is doing in our generation. That’s why in Start Here you’ll find dozens of true stories from rebelutionaries who are making a difference in their homes, at their schools, and around the world. We love sharing other young people’s stories because they challenge us as well—and remind us that we’re not alone. We also love the way real-life stories provide a glimpse of the diverse ways God wants to use each of us to do hard things for Him. Toward the end of the book, we’ll be sharing the stories of two rebelutionaries in particular: Ana Zimmerman and John Moore. As you’ll see, Ana and John took on very different hard things, each with the purpose of glorifying God and helping others. At the age of fifteen, Ana raised more than six thousand dollars and organized an event called Love the Least in her hometown. The event introduced her community to the work of Abort73, an organization that exists to show the injustice of abortion. With a group of fellow teens, John Moore wrote, produced, and directed his own feature film at the age of nineteen—and went on to win the $101,000 grand prize at the San Antonio Independent Christian Film Festival. John and Ana faced many of the same hurdles and questions you’re encountering. Their stories provide an in-depth look at the beginning, middle, and end of the “do hard things” process. We think you’ll be encouraged and inspired. As thousands of young people around the world are discovering, doing hard things is the most satisfying, thrilling way to live some of the best years of our lives. for whatever calling He has for us. For some of us, that calling will be big in the world’s eyes, and for some of us it will be small. Whether it is big or small, God will be glorified—and the world will be changed by a generation that gives up seeking worldly success to pursue a life of faithfulness. That’s when the ordinary becomes extraordinary. And that’s what this book is about.